Writing with Fisher (Narrative Journalism/Rutgers Univ. ; After the Fire: A True Story of Friendship and Survival, 2008, etc. ), Yamma Brown recalls what it was like to grow up in the shadow of one of the most famous and influential entertainers of all time, James Brown (1933-2006). 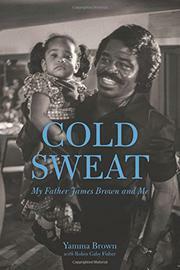 The author begins at the end by recounting her father’s death and subsequent funeral in 2006, which was held at Harlem’s Apollo Theater with the sort of ostentation and pomp that one would expect from James Brown, even in death. From there, she begins to reconstruct an ambivalent portrait of her father’s life, from his time as a youngster shining shoes in small-town Georgia to his eventual position of power in the entertainment industry and all the trappings of fame and celebrity. But in a somewhat jarring transition, the book goes from rosy recollections of riding ponies on the family ranch to the chapter ominously entitled “Dad’s Beating Mom Again.” Suddenly, the memoir takes a seriously dark turn and never looks back. The young author went about the traumatic business of trying to come to terms with domestic violence from a tender age, watching her father physically abuse two unfortunate wives. But even more depressing is the author’s own near-fatal dealings with physical abuse from her own husband, coming about almost as if it were an inherited trait from her battered mother. In fact, the author’s story of life with her conniving, violent, near-psychopath of a husband begins to overtake the story of her relationship with her father. Unfortunately, it took a near-fatal beating from her lowlife husband before she finally scraped up the courage to leave victimhood behind. A courageous and often unsettling look at the not-so-glamorous consequences of being the offspring of a major celebrity.